As protesters camp out in Albany to demand better protections for renters, lawmakers cop out on their consituents with a lukewarm rent regulation agreement. The New York State Capitol looked grand at sundown, lit up bright against the falling dark and quiet streets. Across from the building, in Albany’s Academy Park, next to a sign proclaiming the “Birthplace of Modern Electricity,” a small encampment was growing, air mattresses being inflated, sleeping bags unrolled. It was Monday evening, June 22. 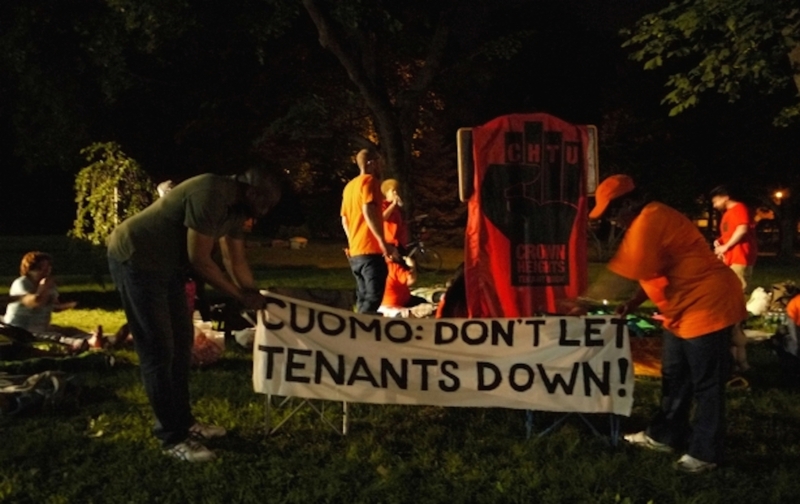 Waving handwritten signs saying “Cuomoville,” the campers were setting up a protest against what they saw as New York Governor Andrew Cuomo’s failure to keep his promises on rent-law reform. They were tenants and activists—members of New York Communities for Change, the Crown Heights Tenant Union, Make the Road New York—and they had trekked all the way from New York City’s poorer outer boroughs, mostly, from rapidly gentrifying Crown Heights, and Bushwick in Brooklyn and from the Bronx. Some of them had already slept out on the Manhattan streets in front of Cuomo’s New York City office last week, after the regulations that keep about a million apartments relatively affordable for working-class tenants expired. Now they were doing it again, spending a night under the Albany stars in an effort to keep the pressure on the governor to secure protections for city renters. For a city in which some 1.7 million people live below the official federal policy threshold, rent regulation is often the only way they can hang on. Many New Yorkers are in James’s position. About half of New York’s 2 million rental apartments are rent-stabilized, meaning that the landlord can only increase the rent on tenants by a set percentage each year. For a city where around 1.7 million people live below the official federal policy threshold, rent regulation is often the only way they can hang on. The percentage is decided by the city Rent Guidelines Board, appointed by the mayor, but the rent laws are decided in Albany, where state legislators from outside of the city have little incentive to ensure a stable environment for renters outside their jurisdiction, and often get big donations from developers in order to do just the opposite. Even the Rent Guidelines Board is not wholly sympathetic to tenants; last year, despite calls from Mayor Bill de Blasio for a rent freeze, it still voted for a 1 percent increase. De Blasio rode outrage over New York’s staggering inequality into office, but Albany continues to be where progressive policies go to die. In neighborhoods like James’s Crown Heights, rents have been spiking: one-bedrooms were up 20 percent between 2013 and 2014, and studio apartments jumped a whopping 37 percent. That happens when tenants move out and landlords are allowed to raise the rent 20 percent; once the legally allowed rent is more than $2,500 a month, the apartment is deregulated through a process called vacancy decontrol and the landlord can charge whatever he or she can get away with—a loophole that has sped the loss of tens of thousands of affordable apartments each year. In fact, since 2011, the last time rent laws were renewed, more than 35,000 rental apartments have been deregulated. Housing activists, along with most Democrats, wanted to do away with vacancy decontrol. A sign hanging over Cuomoville echoed that call. But on Tuesday afternoon, a week after the rent laws expired—and just hours after the Cuomoville protesters rolled up their makeshift encampment—lawmakers announced a tentative deal that would leave vacancy decontrol in place, while also extending the rent laws for four years. The agreement appears to go with much of the Republican proposal for the rent laws, including increasing the threshold for vacancy decontrol by a modest $200—to a rent of $2,700 a month—and keeping a fat tax credit for developers largely intact. Full details were not immediately available, but the immediate response from housing activists was anger. Even during the best of times, Albany has been slow to act and unfriendly to the demands of City residents. But this year has not been the best of times. After US Attorney Preet Bharara indicted Assembly Speaker Sheldon Silver (D-Manhattan) and Senate majority leader Dean Skelos (R-Long Island), and began circling closer to the governor, the business of state government slowed to a crawl. Legislators were able to pass only the least consequential items—like designating the wood frog the official state amphibian—while the major issues languished, destined to be rolled into yet another “big ugly” omnibus bill that smashes together unrelated issues, from rent regulation to mayoral control of New York City schools to criminal-justice demands. It remains to be seen whether new Assembly Speaker Carl Heastie, who negotiated the deal with Cuomo and the temporary Senate Republican leader, John Flanagan, can whip enough votes to pass it; unlike Silver, who ruled with an iron hand, Heastie is new on the job and might face rebellion from some Democrats who have to answer to angry constituents. On Monday night, Assemblyman Walter Mosley, visiting his Brooklyn constituents at Cuomoville, pointed to the demonstration as an example of why updating the rent laws was so important. Tenants, he noted, continue to be harassed by landlords and taken to court over baseless claims. Activists pointed the finger at the governor, whom they have long accused of cozying up to conservative interests. Cuomo, whose power has only grown since Silver and Skelos were indicted, might have played the decisive role in the rent-laws stalemate. With the Democrats pushing for more protections for tenants, and the Republicans pulling to undo them, he could have been the tie-breaking vote, tipping the updated rent laws toward tenants. And he had made noises about wanting stronger rent laws. But he was largely missing in action for the past week—even skipping a fundraiser for his next election campaign. This was, as Jimmy Vielkind at Capital New York notes, a big difference from previous years, when the governor stumped heavily for his priorities and pressured lawmakers to get in line. The tenant coalition had worked to draw attention to the governor’s ties to the real-estate industry, particularly heavyweight landlords like Litwin, whose company, Glenwood Management, has been caught up in the unfolding corruption scandals that have rocked Albany. Charges against Silver and Skelos both include steering Glenwood money into their own pockets in exchange for landlord-favorable policy. On Monday, activists held an action “searching” for Cuomo at a building managed by Glenwood Management, unfurling a banner calling him “Governor Glenwood,” and questioned whether his ties to the scandal-ridden real-estate company were the reason he didn’t show up for tenants. Glenwood has donated some $3.6 million to state politicians in the past four years—$1.45 million of that on Cuomo. Records showed that the governor has met in recent years with Litwin and Glenwood’s Senior Vice President Charles Dorego to discuss rent regulations. Dorego is now cooperating with Preet Bharara’s ongoing corruption investigation. Of course, wealthy donors buy the policy results that they want all the time and it’s perfectly legal; Republicans and Democrats don’t need to be committing crimes in order to sell out the working people who elect them. And it’s certainly not the first time that Cuomo has been criticized for doing so. His first term was littered with such moments, yet he was reelected in 2014. The governor made a lot of promises last year in order to get the endorsement of progressive groups and the Working Families Party against challenger Zephyr Teachout. He won those endorsements, but he has yet to keep most of his promises—which has a cascading effect. As Cuomoville protester Reynold James noted, without stronger tenant protections, other policies that help working people can wind up meaningless. James came to the encampment straight from the final hearing of the Wage Board that Cuomo empaneled in May to decide whether New York’s fast-food workers will get the $15 an hour they’ve been demanding since 2012, but he notes that the multi-year timetable for the wage increase means that rent, too, will have increased and will eat up a chunk of the raise workers would get. Since 2011, the last time rent laws were renewed, more than 35,000 rental apartments have been deregulated. For Nurse, the struggles he and other tenants are facing bring up old memories. From when he was growing up in the 1970s, he remembers the burning buildings, torched by their owners to collect insurance money. These days, he said, they don’t burn the buildings; they simply allow them to fall into disrepair and wait for the tenants to leave so that they can raise the rents. Nurse is a carpenter who learned his trade on those burned-out Bronx buildings, and he complained of fat subsidies being handed to landlords who spend the money on themselves and leave their buildings to rot. His own building has been the subject of a New York Daily News report on its disrepair; a quick search on the Housing Preservation and Development site reveals more than 200 open violations. “We do not want landlords to continue to act as vampires against our tenants and against our country,” Nurse said. The rent-regulations deal will do little to improve an already-broken housing system in New York City, and the slapdash process by which it came about simply highlights for many the ongoing dysfunction of the state government. For New York City residents, whose city government is not without problems but generally gets things done these days, the state government’s failure to protect its citizens’ basic housing rights has eroded what little faith they had left in their leaders in Albany.